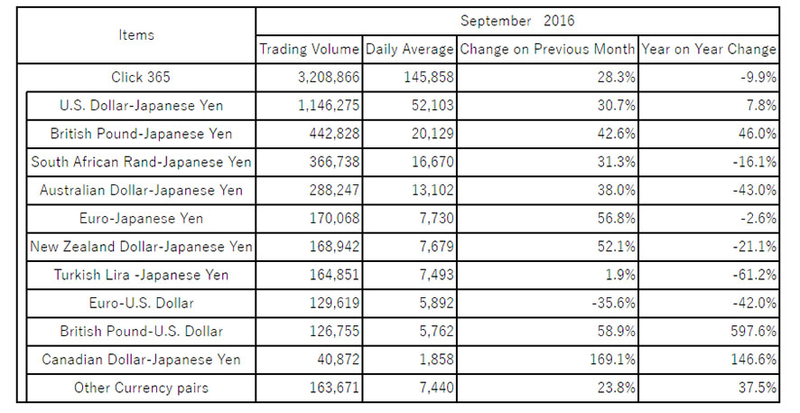 September 2016 Forex Industry Metrics: Solid Rebound! Forex trading activity woke up from its slumber in September, posting a solid rebound in metrics for the month after its lull in the past few ones. What drove trading volumes this time? Data from international derivatives marketplace CME Group revealed that September trading activity averaged 969,000 contracts per day, up 2% from the same month a year ago. These gains were driven by an 18% monthly jump in British pound futures and options, as well as higher average daily volume (ADV) for emerging market currencies such as the Russian ruble, Mexican peso, and Brazilian real. Institutional trading activity got a boost, with forex ECN Hotspot FX reporting a 25% monthly gain in ADV from $22.6 billion in August to $28.3 billion last month. Meanwhile, FastMatch also reported its second best-ever month in trading volumes, as forex ADV was up 33% month-over-month to $13.7 billion. Multibank forex aggregator FXSpotStream announced a 24% increase in September volumes while the institutional arm of Gain Capital, GTX, printed a 19% month-over-month rise in ADV. As for exchanges, the Tokyo Financial Exchange saw a whopping 28.3% increase in monthly trading volumes for September but still down 9.9% on a year-over-year basis. Its breakdown of currency pairs traded on its Click 365 platform reflected gains across the board, except for EUR/USD which was trading sideways for most of the month. The strongest monthly gains in activity were seen on CAD/JPY, GBP/USD, EUR/JPY, and NZD/JPY. Russia’s Moscow Exchange also reported a pickup in total forex market turnover for September, indicating a 8.2% month-over-month rise. Trading volumes for other products in the money market and in bonds reported even stronger gains for the month. As it turns out, the return in volatility driven by longer-term market themes for the month likely supported the rebound in trading volumes. Among these are the major central bank announcements in September, which gave market watchers a better idea of what policymakers might have in mind for the rest of the year. In case you missed it, the FOMC pretty much confirmed that they’re still on track towards hiking interest rates while the RBNZ hinted that they might have room for another cut. Meanwhile, the RBA shifted its stance to suggest that they’re done with easing for now while the BOJ kept traders on the lookout for more stimulus. Apart from all that policy ruckus, the OPEC informal gathering last month also rocked price action for crude oil and the Loonie. Moving forward, this pickup in market volatility seems to have carried on for the early part of this month, hinting that volumes might stay afloat as well. A number of new market themes have emerged, namely the idea of ECB tapering and the return of Brexit uncertainties, so euro and pound pairs could enjoy higher volumes. Also, top-tier economic releases for this month could set the stage for central bank decisions for this last stretch of the year so make sure you don’t get left behind if forex action heats up!